This is one of the most common questions from parents of 6 and 7 year-olds. There are many reasons why your child’s permanent teeth growing in yellow. The most common reason for this,the intrinsic color difference between the permanent teeth and baby teeth.We hear this concern frequently at high point Pediatric Dentistry. Baby teeth are usually very white in appearance. 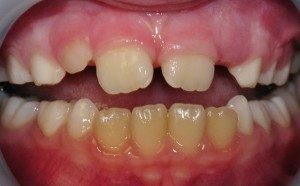 But when children begin the stage of losing their, baby teeth and have newly erupting permanent teeth growing in yellow,the color shades are very noticeable. So what’s the deal. We get this question all the time from concerned parents. Believe it or not,it is perfectly normal. Adult teeth,because of their composition,do have a different tone than baby teeth and often appear yellow,especially when they erupt right next to brilliant white baby teeth. The baby teeth is naturally whiter than permanent teeth. The main reason for the permanent teeth growing in yellow teeth because, Permanent teeth not only having a thicker enamel,but the layer just under the enamel(dentin) is also more dense. This under layer is gives the permanent teeth a color slightly more yellow than the baby teeth. The second thing is that the ratio of dentin to enamel is appear higher on the baby teeth,which means that the inner color of the dentin is more likely to be visible through the adult’s tooth enamel shell. Make sure that they are brushing and flossing regularly. Plaque and tartar build up will cause the teeth to look more yellow than really are. Why dentists are not recommended any white toothpaste ? Most of the dentists are not recommended any white toothpaste for children. The professional whitening be performed before the age of 14 because it’s not known whether or not those products may affect growing teeth. There is no need for anything you can do to improve the color of your child’s teeth. Just to make sure that there’s not a yellow film covering your child’s teeth.You should just leave the color alone. Until your child is teen and if there is no change in it appear a dentist. It’s also important to understand the society vision of white teeth and to given awareness about the topic,permanent teeth growing in yellow. Also It is very important for given an awareness to your child about the color change of their teeth,there are some things that can be consider. Regular brushing, flossing and good dental habit will usually resolve these issues in time. When the tooth grows and thickens, it will eventually lose the yellow color. Avoid sugary and carbonated drinks, as well as coffee and tea will avoid staining. Also avoid highly acidic foods and sour candies that ac erode the enamel on teeth. Also remember this slightly yellow-appearing permanent teeth are different from highly stained discolored teeth. Otherwise those with white or brown spot on teeth. Dark staining and spots can be a sign of a medical problem and needs to be evaluated by a dentist. You can have the beautiful natural smiles that you have all ways dreamed off.